Founded in 1983 by members of the Berlin Philharmonic Orchestra, the Scharoun Ensemble is one of Germany’s leading chamber-music organizations. 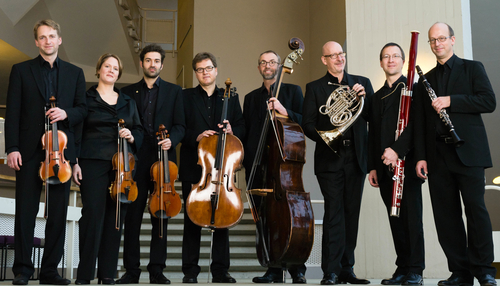 With its wide repertoire, ranging from composers of the Baroque period by way of Classical and Romantic chamber music to contemporary works, the Scharoun Ensemble has been inspiring audiences in Europe and overseas for more than a quarter of a century. Innovative programming, a refined tonal culture and spirited interpretations are hallmarks of the ensemble, which performs in a variety of instrumental combinations. The permanent core of the Scharoun Ensemble is a classical octet (clarinet, bassoon, horn, two violins, viola, cello and double bass), made up entirely of members of the Berlin Philharmonic. When called for, the ensemble brings in additional instrumentalists as well as noted conductors. The Scharoun Ensemble has prepared and presented various programmes under the direction of Claudio Abbado, Sir Simon Rattle, Daniel Barenboim and Pierre Boulez. It has also performed with singers including Thomas Quasthoff, Simon Keenlyside and Barbara Hannigan, and, for interdisciplinary projects, the ensemble has engaged such artists as Fanny Ardant, Loriot and Dominique Horwitz.